Authorities have warned shipping in the Pacific Ocean to maintain vigilance for airborne volcanic material after a volcano erupted near one of the Ogasawara Islands, some 1,000 kilometers south of Tokyo, NHK reported Japan’s Meteorological Agency (JMA) as saying. Video footage shows a plume of black and white smoke and steam rising to a height of more than 600 meters above a new landmass measuring about 200 meters across. Black and white smoke and steam rising to a height of more than 600 meters above a new 200-m long landmass created by volcanic eruption near Nishino shima, Bonin Islands, south of Japan. Screenshot from NHK news video clip. Screenshot from NHK news video clip. “The agency says multiple clusters of white smoke overhead suggest intermittent explosions,” said the report. Volcanic activity created a new island which was fused to the uninhabited Nishinoshima between 1973 and 1974, the last time when eruptions occurred near the island. Bonin Islands (aka, Ogasawara Group, in Japan). Click Image to Enlarge. In 2010, one of the volcanoes in the region erupted, spewing smoke and ash to a height of about about 100 meters above the sea level. The surrounding sea area changed to a greenish-yellow color with nearby areas turning cloudy. 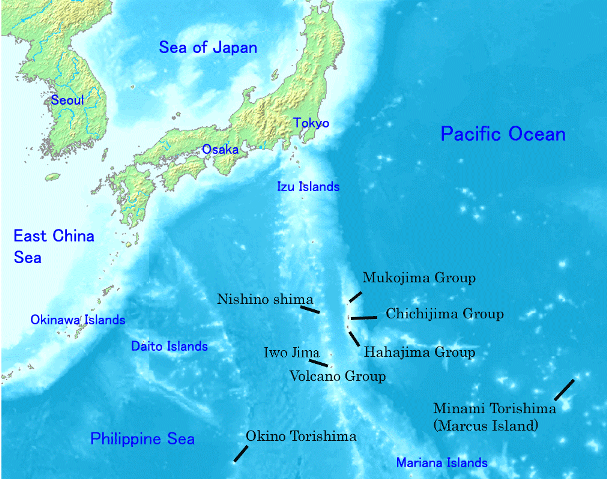 JMA said the volcano, called Fukutokuokanoba, had erupted seven times since 1904, forming ephemeral islands (temporary land masses) on three occasions, all of which later sank below the ocean surface. The first known ephemeral island called Shin-Iwo-jima (New Sulfur Island) was formed in 1904, and the most recent in 1986. “Mount Merapi experienced a phreatic eruption. Its status remains normal due to a lack of activity,” said Yogyakarta’s Geological Disaster Technology Development and Research Agency (BPPTKG). Mt Merapi was placed on “Yellow Alert,” or “Level II” of the country’s 4-level alert system, on August 3, 2013. Latest Image of Mt Merapi. Credit: Badan Geologi. “On Monday at 4:52 a.m. before the eruption, BPPTKG detected an earthquake in Ciamis, West Java, at a magnitude of 4.7 on the Richter scale. The tectonic quake is believed to have shaken the magma chamber of Mount Merapi causing it to release gas from below,” said BPPTKG spokesperson. Merapi ejected volcanic materials about 2 kilometers into the air showering a 60-km radius area east of the volcano with ash, said the report. The authorities have since imposed 1-kilometer exclusion zone around the volcano base. More than 600 families living in Kalitengah Lor, Kalitengah Kidul and Srune hamlets, in Glagaharjo village, Sleman regency, Yogyakarta, have been evacuated. Hundreds of other villagers living on the western flank of Mount Merapi also fled their homes. “The volcanic ash also affected residents in nearby towns. In Surakarta, Central Java, residents were shocked by the sight of volcanic ash covering streets, gardens and roofs. 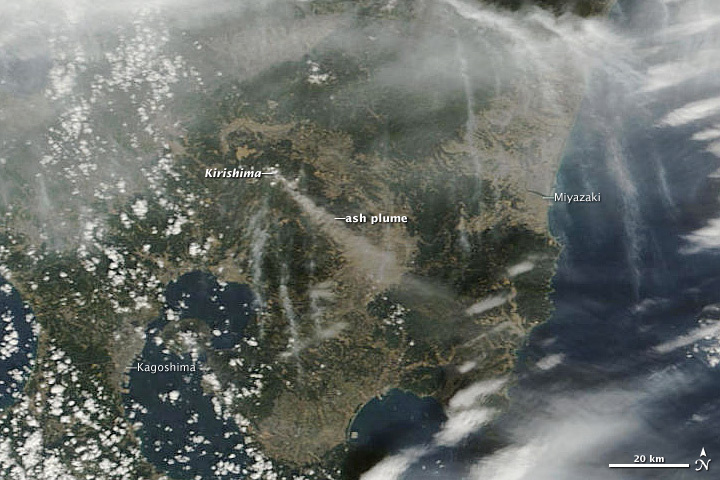 The ash rain continued until around 10 a.m. on Monday.” said the report. Merapi eruptions have killed hundreds of people in the past couple of decades. Mount Merapi is one of the most active volcanoes in Indonesia. The 2010 its eruptions killed more than 300 people dead and forced about 400,000 people to evacuate their towns, while a 1930 eruption left at least 1,300 dead. The Indonesian ministry of transportation has diverted all flights to avoid routes near Mt Sinabung, located in Karo District, North Sumatra, which has erupted multiple times since last week. The authorities say Mt Sinabung eruption on November 12 ejected volcanic material that covered five districts destroying some 1,893 hectares of citrus plantations in Tanah Karo, which has impacted fruit production, said a report. The explosive activity follows a series of most recent eruptions exhibited by the 2,460-meter high volcano that began in September 2013, leading to a significant eruption on October 24, which saw the volcano spewing smoke and ash to a height of about 3km above the crater summit, followed by other eruptions, especially the explosive eruption that occurred on Sunday, November 3. The eruption from Europe’s most active volcano ejected towering columns of ash and fountains of molten lava over Sicily Saturday night. Etna, one of the most active volcanoes in the world, is in an almost constant state of activity. The eruption was the 16th paroxysmal explosion at Etna so far this year, forcing officials at Cantania Airport to close airspace above much of Sicily as a precautionary measure. Mt Etna is the largest of the three active volcanoes in Italy, covering an area of about 1,200km², with a basal circumference of 140km. More than a quarter of Sicily’s live on the slopes of the 3,330-meter volcano.Volcanic activity first occurred at Etna about 500,000 years ago. A massive lava flow from an eruption in November 1928 destroyed the village of Mascali. Other major 20th-century eruptions occurred in 1949, 1971, 1981, 1983 and 1991–1993. The alerts follow the latest eruption at Mt Sinabung, which saw the volcano ejecting ash to a height of about 7 km above the summit, forcing the authorities to evacuate about 5,600 people in several villages, according to Indonesia’s Center for Volcanology and Geological Disaster Mitigation (PVMBG). Indonesian authorities have established a 3-km exclusion zone near the volcano following the Tuesday eruption for the second time in 9 days. PVMBG had issued a “level three,” or “orange alert,” recommending villagers to stay out of the 3-km danger zone on November 3, 2013, followed by a 7-day state of emergency declared by the local authorities. Mt Sinabung is one of 130 or so active volcanoes in the Indonesian archipelago, whose 18,307 islands (922 of the islands are permanently inhabited) straddle the Pacific Ring of Fire (PRF). 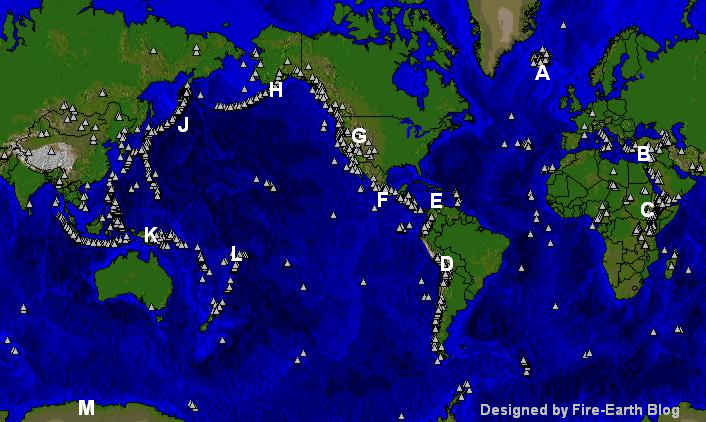 PRF, aka the circum-Pacific seismic belt, is home to 452 volcanoes, or more than 75% of the world’s active and dormant volcanoes. Mount Sinabung spewing volcanic ashes as seen from Simpang Empat Village in Karo, North Sumatera (September 15, 2013). Credit: ANTARA/Septianda Perdana. Mt Sinabung erupted in August 2010 after 410 years of dormancy. The eruption claimed a dozen lives and displaced thousands of others. 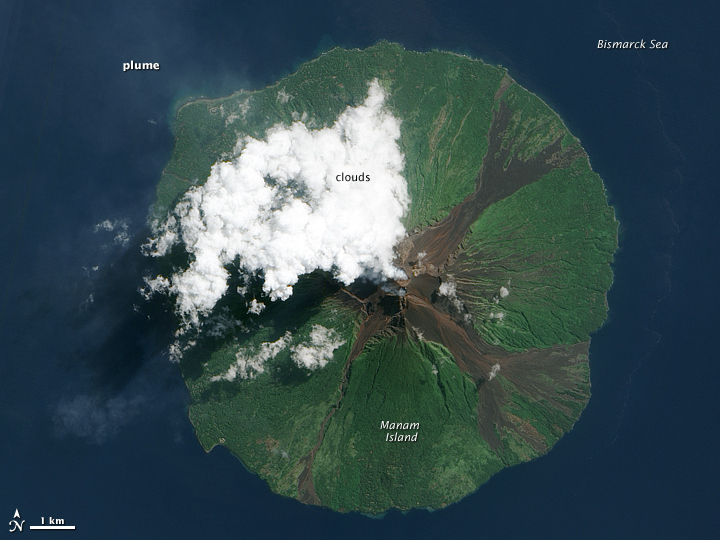 The eruption which occurred on August 29, 2010 was followed by a more powerful explosion the next day, and much stronger blast on September 7, 2010. Sinabung spewed ash to a height of about 2km in its second eruption in two days on August 30, 2010. The PVMBG categorizes Sinabung as a type A volcano, or those that have erupted since 1600. Type B volcanoes have not erupted since 1600 but show signs of activity, and type C are those that have not erupted in recorded history. Mount Sinabung ejected tephra into the air as seen from Tanah Karo, North Sumatra, Indonesia, Friday, Sept. 3, 2010. (AP Photo/Dedy Zulkifli). Image may be subject to copyright. Indonesian Volcanoes have been responsible for a number of cataclysmic explosions in modern history. The eruption ejected about 21 cubic kilometers of volcanic matter and destroyed two-thirds of the Krakatoa island. The explosion also spawned giant tsunamis killing an estimated 40,000 people. Based on their models, our colleagues at EDRO forecast that the collapse of Singapore may occur as a result of volcanic activity on the island of Sumatra. However, they have not disclosed any further detail. PVMBG has placed five volcanoes on the second highest level of activity “Level III, Orange Alert,” and 17 others on third highest alert level “Level II, Yellow Alert.” Following table shows the alert level designations, as of November 16, 2013. Indonesia Volcano Alerts as of November 16, 2013. Source: PVMBG. Image enhanced by FIRE-EARTH Blog. The massive 3,085-meter-high Plosky [flat] Tolbachik, one of Russia’s largest volcanoes, has spewed two streams of lava, one extending for about 18km and the other 6km one made 18 kilometers, said a report. 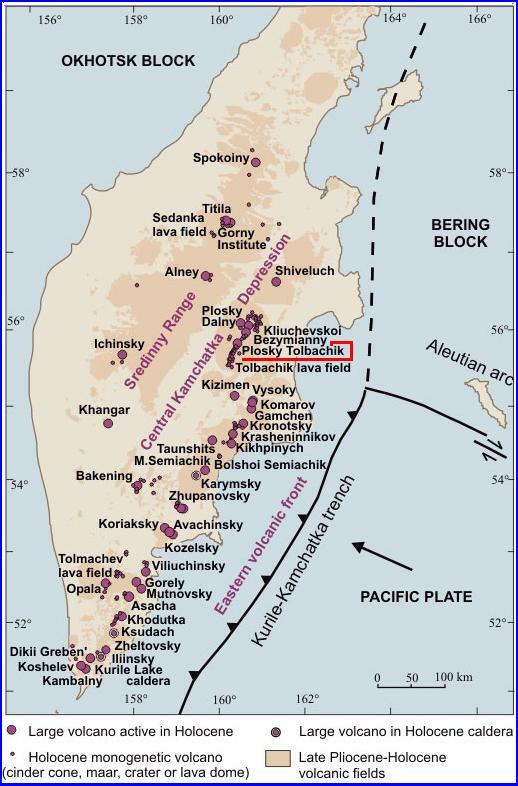 Simultaneous activities have also been detected in the Kizimen and Shiveluch volcanoes in the Kamchatka region, the report said. According to local reports residents were returning to their homes along the mountain’s slopes, when the eruption occurred. The force of Sunday explosion however send them scurrying back into emergency shelters. An estimated 30,000 villagers live within a 3.5-km evacuation zone which was established on Sulawesi Island a week ago. Mount Lokon’s eruption seen from Tomohon, North Sulawesi, Indonesia, July 14, 2011. Image Credit: Jakarta Post/ANN. Image may be subject to copyright. Mt Lokon erupted at least 3 times on Saturday spewing thick plume of grey ash and volcanic fumes above the Tompaluan crater, located between the Lokon-Empung peaks. Alert Level raised to 4 by Indonesia’s CVGHM has remained at the maximum level since July 11 eruption, when the volcano ejected ash about 5km above the crater summit. Mount Lokon, one of Indonesia’s most active volcanoes, is located about 20 km from North Sulawesi provincial capital of Manado. “Historical eruptions have primarily produced small-to-moderate ash plumes that have occasionally damaged croplands and houses, but lava-dome growth and pyroclastic flows have also occurred.” GVP said. The twin volcanoes Lokon and Empung rise above the towns of Kakaskasen and Kinilow as viewed from the flanks of Mahawu volcano. The more prominent Lokon volcano (left), is higher than Empung volcano (right) and lacks a summit crater. Most historical eruptions from Lokon-Empung, one of the most active volcanoes on Sulawesi Island, have originated from Tompaluan crater, which can be seen surrounded by fresh ash deposits in the saddle between the two peaks. Gunung Tetawiran rises beyond the saddle. 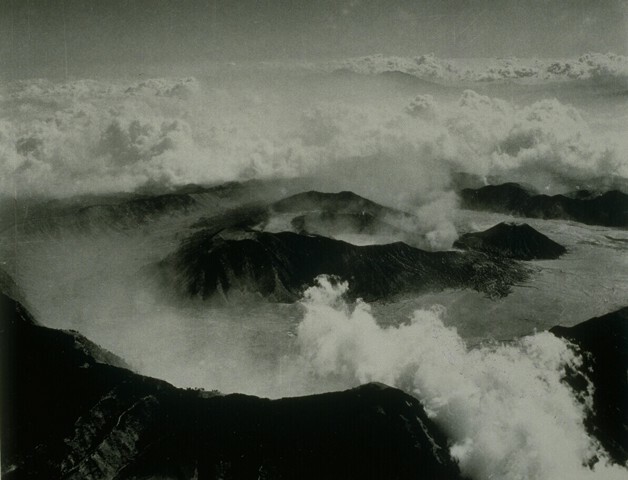 Photo by Agus Solihin, 1998 (Volcanological Survey of Indonesia); caption by GVP. 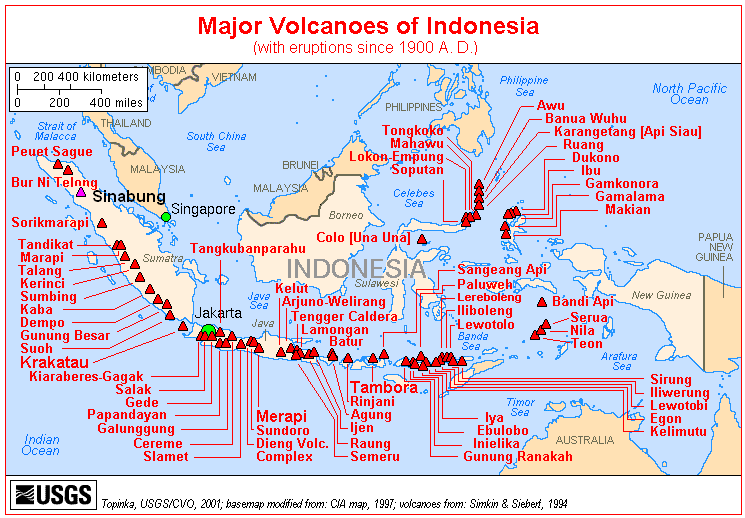 A Map of Listed Volcanoes of Indonesia. Pu`u `Ō `ō crater seen on March 26 when a small lake of fresh lava formed. Click image to enlarge. * Mount Karangetang erupted about 6 hours after the March 11 Megaquake struck near the east coast of Honshu. Kamchatka Volcanoes The Fat Lady? Mt. Baekdu may erupt, according to North Korean authorities, Radio Free Asia reports. Local geologists are again warning of a volcanic eruption at Mt. Baekdu, a volcano located on the border between North Korea and China. One of the largest known eruptions of the modern geologic period (the Holocene) occurred at Baitoushan Volcano (also known as Changbaishan in China and P’aektu-san in Korea) about 1000 A.D., with erupted material deposited as far away as northern Japan—a distance of approximately 1,200 kilometers. The eruption also created the 4.5-kilometer-diameter, 850-meter-deep summit caldera of the volcano, which is now filled with the waters of Lake Tianchi (or Sky Lake). This oblique astronaut photograph was taken during the winter season, and snow highlights frozen Lake Tianchi and lava flow lobes along the southern face of the volcano. Baitoushan last erupted in 1702, and geologists consider it to be dormant. Gas emissions were reported from the summit and nearby hot springs in 1994, but no evidence of renewed activity of the volcano was observed. The Chinese-Korean border runs directly through the center of the summit caldera, and the mountain is considered sacred by the predominantly Korean population living near the volcano. Lake Tianchi is a popular resort destination, both for its natural beauty and alleged sightings of unidentified creatures living in its depths (similar to the legendary Loch Ness Monster in Scotland). Mt. Baekdu Volcano eruption in 1903 (?) Source NEWSIS via Chosunilbo. Image may be to subject to copyright. Lake Tianchi (or Sky Lake) at the summit caldera of Mt. Baekdu Volcano. Promotional photo published by N. Korean government. “Quoting sources in Ryanggang Province, North Korea, the station said two geography professors of Kim Jung-suk University of Education involved in a Mt. Baekdu expedition team have recently been to Pyongyang to attend a seminar on Mt. Baekdu volcanic activity.” Chosunilbo reported. Cathay Pacific, Jetstar, Singapore Airlines and Virgin Blue were forced to cancel all flights to and from Bali until further notice. Mt Bromo ejected fountains of lava to a height of about 200m during a strombolian eruption. Several nearby villages were covered in hot ash spewed by the volcano, report say. The 2,330-m high volcano is located in Probolinggo, East Java province, about 750km east of the Indonesian capital of Jakarta. January 25, 2011. Photo credit: AFP/Aman Rahman. Image may be subject to copyright. Shinmoedake volcano in southern Japan, which began erupting on Wednesday, ejecting rocks, ash and smoke about 4,600m into the air, was still erupting on Thursday. Local highways and railroads have become impassable as a result, and at least 4 flights to the area have been canceled as a precaution, reports say. Shinmoedake volcano continued erupting for a second day on Thursday. Freeze frame from ITN news clip. 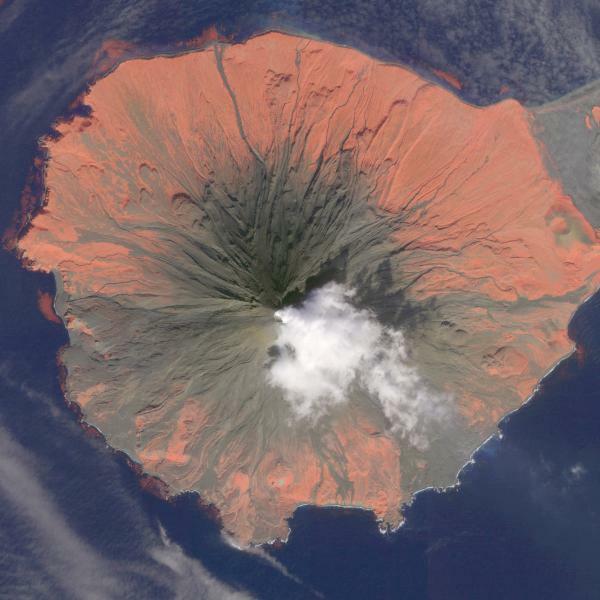 Natural-color satellite image of Shinmoedake volcano captured by MODIS aboard NASA’s Terra satellite on January 26, 2011. Shinmoedake is a volcano in the Kirishima volcanic complex on Japan’s Kyushu island. Source: NASA-EO. Click image to enlarge. Lightening is photographed using time exposure during an eruption from Mt Shinmoedake in the Kirishima volcanic complex on the border of Kagoshima and Miyazaki prefectures, southern Japan. Photo: Shuji Uchimura/AP. Image may be subject to copyrights. Indonesian government raised the eruption threat warning to code red, the highest alert status. “The ash contains chemical substances which could cause engine trouble” to planes flying nearby, officials said. The volcano was reportedly ejecting columns of ash into the air to a height of about 700 meters (2,300 feet). The volcano is expected to continue erupting for “many days” a government volcanologist said. Will Arabia Be So Lucky Next Time? A swarm of at least 30,000 tremors that struck Harrat Lunayyir, an ancient lava field in western Arabia, between April and June 2009 was a ‘failed eruption,’ US and Arabian geologists say. An aerial view of one of the volcanoes in the Al-Aayiss area. Based on the ground deformation satellite data, depth and signature of the shockwaves, the researchers have concluded that the seismic activity was related to a ‘failed volcanic eruption.’ They say magma has now moved very close to the surface, increasing the probability of an eruption. The Arabian peninsula’s western side comprises lava fields [harrat] measuring up to 200,000 square kilometers, which were formed over the past 30 million years, after Arabia split from Africa. Fissures formed when the earthquake swarm struck Harrat Lunayyir, western Arabia, between April and June 2009. Image source: Arabian media. Image may be subject to copyright. FEWW Saudi Quake Swarm Forecast 100 pct Correct! According to Indonesia’s head volcanologist, Surono, Today’s eruption was more powerful than the first yesterday. “Earlier today was another eruption at 6.30 a.m., sending out smoke as high as two km, more or less.” He said. He said it was impossible to know when the eruptions would stop, but it was unlikely volcanic dust would drift to neighboring countries. “Here, [the volcanic dash] is three millimeters (1/8 of an inch) thick on the leaves of plants,” he said, adding that he did not believe the neighboring countries would be affected as a result of this eruptive episode. Indonesian officials have issued a red alert after Mount Sinabung on the island of Sumatra began spewing lava early Sunday morning. Villagers ride a motorcycle while covering their mouths at the district of Tanah Karo outside the city of Medan, North Sumatra, as the Mount Sinabung volcano spews smoke in the background August 28, 2010. Credit: Reuters/Tarmizy Harva. Image may be subject to copyright. The volcano had been spewing smoke and ash to a height of about 1.5km a.s.l. throughout Saturday, local reports said, quoting eye witnesses who saw lava spewing out of the volcano from 7 km away. The authorities have evacuated up to 15,000 residents living near the volcano. Mount Sinabung is one of Indonesia’s 130 active volcanoes, and had last erupted about 400 years ago. Sinabung volcano, seen from Gurukinayan village on the south, shows prominent lava flows on its flanks and a dramatic summit spine. The summit of Gunung Sinabung is much less frequently visited than neighboring Sabayak volcano to the NE. 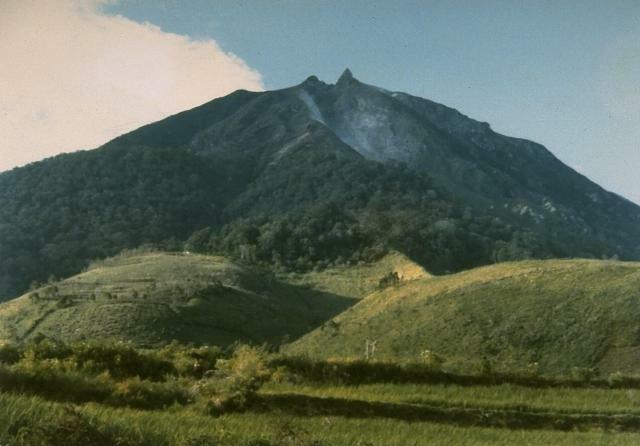 Photo by S. Wikartadipura, 1982 (Volcanological Survey of Indonesia). Source: GVP. Approximate location of Sinabung is marked on the map by FEWW. The volcano is located about 260km east of the epicenter of the 9.1 – 9.3Mw earthquake which struck off the coast of Sumatra on December 26, 2004, triggering the deadly Boxing Day Tsunami. 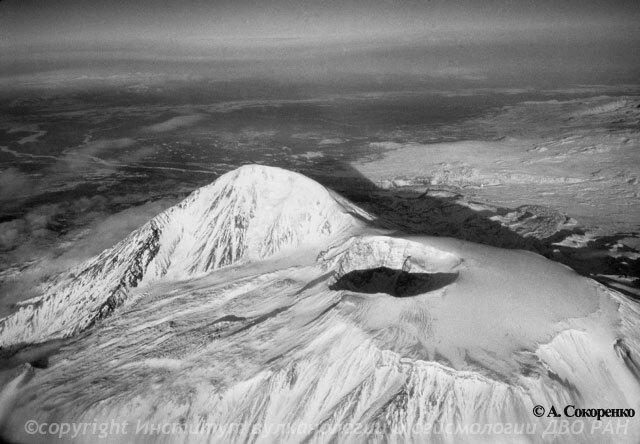 The massive, flat-topped, 3,085-m Plosky Tolbachik Volcano (55°49’N, 160°24’E) last erupted in 1975-76. The cleaver-edged volcano to the left is Ostry Tolbachik. 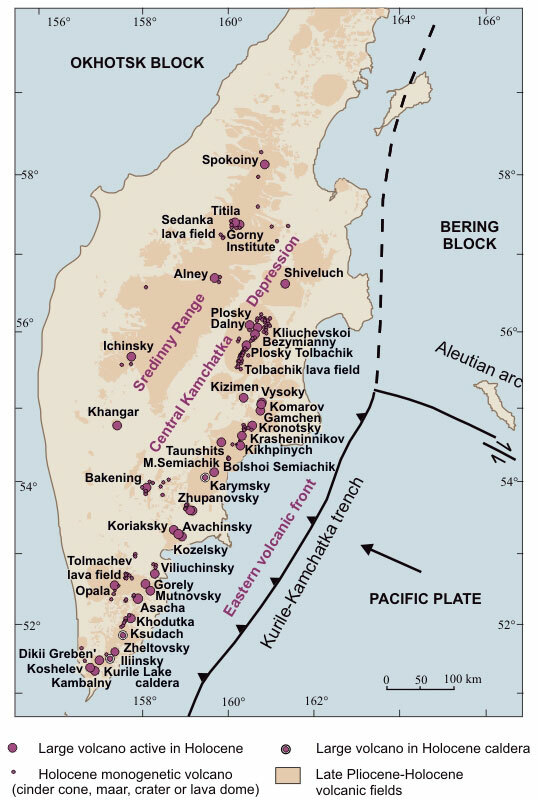 “The 1975-76 eruption from the summit and south-flank fissures was the largest historical basaltic eruption in Kamchatka.” Source: KVERT. Image may be subject to copyright. NOTE: More volcanic activity/unrest may be expected in areas/groups shown in red. An underwater volcano off Sarigan Island, Northern Marianas, about 160km (100 miles) north of the island of Saipan erupted on Saturday sending a plume of steam and ash cloud into the air and showering the ocean surface with volcanic debris, US officials reported on Monday. “An EMO observer aboard an overflight yesterday reported a large area of debris floating in the sea south of the island, and a stationary area of discoloration in the water, presumably above the vent. The crew on Sarigan reported passage of a small wave (less than 0.5 m) following onset of the eruption yesterday.” USGS said. However, satellite images show no sign of ongoing activity, USGS said. Scientists had initially thought the volcanic cloud came from either of the Anatahan or Sarigan volcano, and later verified the source by the trail of debris and water discoloration close to the vent, a USGS official said. The Northern Mariana Islands are located about 6100km (3,800 miles) southwest of Hawaii. Volcanic Activity Summary:	Seismicity and subaqueous eruptive activity have declined at Sarigan Volcano prompting reduction of the Aviation Color Code to YELLOW and the Volcanic Activity Level to ADVISORY. A M6.4 quake (11.119°N, 93.698°E) which struck close to Barren Island Monday, May 31, 2010 at 19:51:48 UTC, may have triggered the Andaman Sea volcano for eruption. Pacaya volcano, located about 25 kilometers south of the Guatemalan capital, erupted late Thursday local time depositing as much as 8 cm of ash over parts of the city. The authorities closed down La Aurora international airport until further notice. The closest villages to the volcano have been evacuated. The 2,552-meter Pacaya volcano is in Group F on the above diagram. The disaster could be exacerbated by heavy rains that would trigger flash floods causing deadly lahars and mudslides. Two people have been killed, and 59 others injured so far, with three children reported as missing. At least 100 homes have been destroyed and many other damaged, as more reports come in. About 2,000 people have been evacuated. On 20 April, INSIVUMEH reported explosions from Santa María’s Santiaguito, which produced ash plumes rising to altitudes of 2.8-3.4 km (9,200-11,200 feet), Global Volcanism Program said. On Monday 26, April the volcano erupted violently sending a plume of ash 8.3 km (27,300 feet) a.s.l., news articles reported. The volcano has calmed since Monday’s violent burst, however, it’s still erupting, according to disaster response agency spokesman David De Leon, AP said. De Leon was quoted as saying that the eruption had damaged local flower harvests, though no injury was caused. A no-fly ban was imposed 20 kilometers from the volcano schools were closed in 10 communities as a precaution. Formed during a catastrophic eruption in 1902, Santiaguito is a 1-km-wide crater on the 3,772-meter Santa Maria volcano, located about 200 kilometers northwest of Guatemala City. It’s believed that about 2,500 people were perished as a result of the 1902 eruption. Santiaguito volcano, seen from the summit of Santamaria. GNU License. Photo by Jon Fink, Arizona State University, 1988 (courtesy of Bill Rose, Michigan Technological University), via GVP. Serial No 1,648. Starting April 2010, each entry on this blog has a unique serial number. If any of the numbers are missing, it may mean that the corresponding entry has been blocked by Google/the authorities in your country. Please drop us a line if you detect any anomaly/missing number(s). (L to R) Usulután: Formed during Holocene (an ongoing geological epoch that began about 12,000 years ago). El Tigre formed during the Pleistocene Epoch (2.588 million to about 12,000 years ago), probably the oldest of member of the family captured in this astronaut photograph. The summit crater of El Tigre has eroded. Chinameca Volcano (also known as El Pacayal) has a two-kilometer-wide caldera formed after a powerful eruption caused its dome to collapse. San Miguel (also known as Chaparrastique), the youngest member of the family, is situated about 15 km southwest of the city of San Miguel, where it takes its name from. 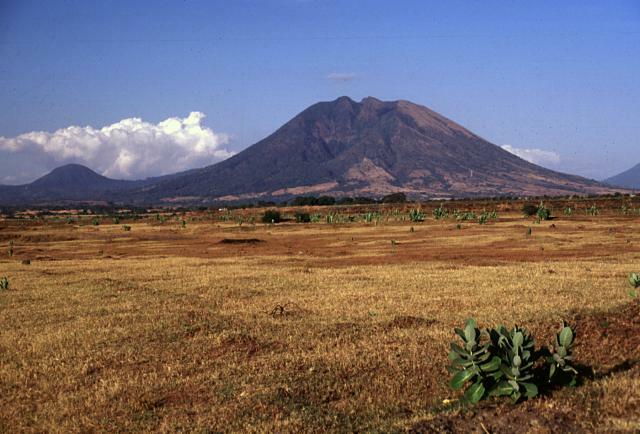 It’s one of the most active volcanoes in el Salvador and last erupted in 2002. (Source of Photo: NASA. Astronaut photograph ISS023-E-22411 was acquired on March 31, 2010). Usulután volcano rises above the Pacific coastal plain at the SE end of a cluster of stratovolcanoes between San Vicente and San Miguel volcanoes. The flanks of the forested Usulután volcano are dissected, but youthful lava flows are present on its southern flanks. The younger summit rocks of 1449-m-high Usulután and Cerro Nanzal pyroclastic cone on the lower SE flank were mapped as Holocene (Weber and Wiesemann, 1978). A broad 1.3-km-wide crater is breached to the east from the summit of Usulután to its lower flank. Several large erosional craters cut the flanks of Usulután, including the valley seen in this view cutting the SW flank. The rounded peak at the left is the young cone of Cerro Oromontique on the margin of El Tigre volcano. Photo by Lee Siebert, 1999 (Smithsonian Institution). Caption Global Volcanism Program (GVP). 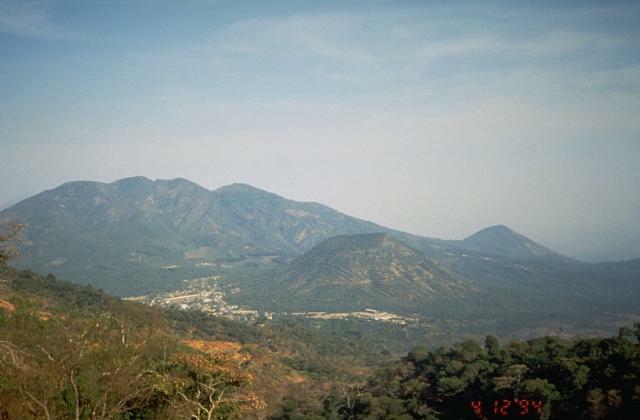 The dissected Pleistocene volcano El Tigre is seen here from the NW on the flanks of Tecapa volcano with the town of Santiago de María at the left center. 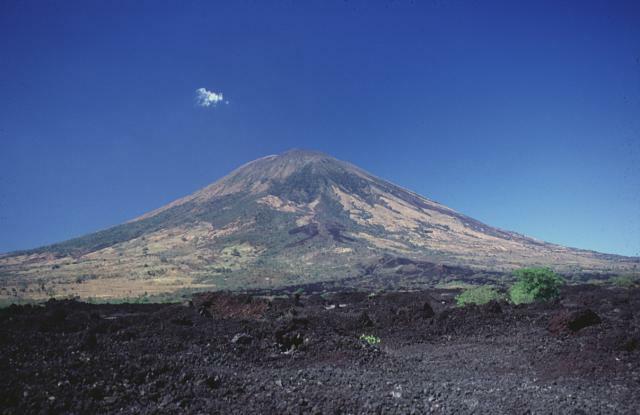 Two Holocene cones, symmetrical Cerro Oromontique in the center of the photo and Cerro la Manita, the small peak on the right horizon, were erupted along a NW-SE-trending fissure cutting the flanks of El Tigre volcano. Photo by Kristal Dorion, 1994 (U.S. Geological Survey). Caption: GVP. Chinameca stratovolcano is seen here from the SE near the summit of neighboring San Miguel volcano. 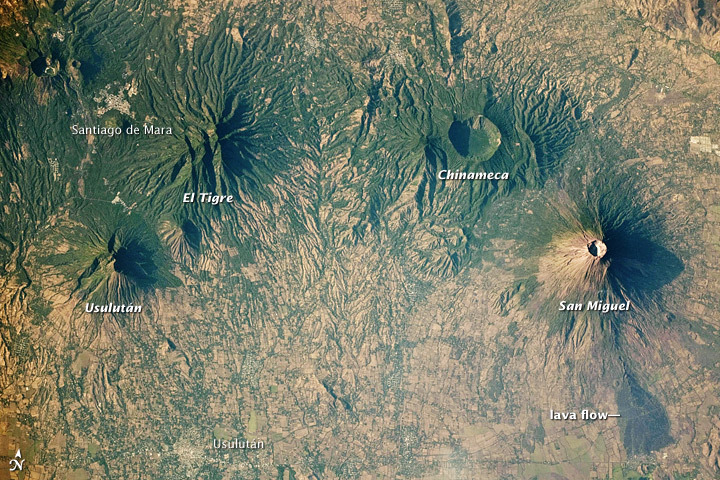 A 2-km-wide, steep-sided caldera, Laguna Seca el Pacayal (right-center), truncates the summit of Chinameca volcano. 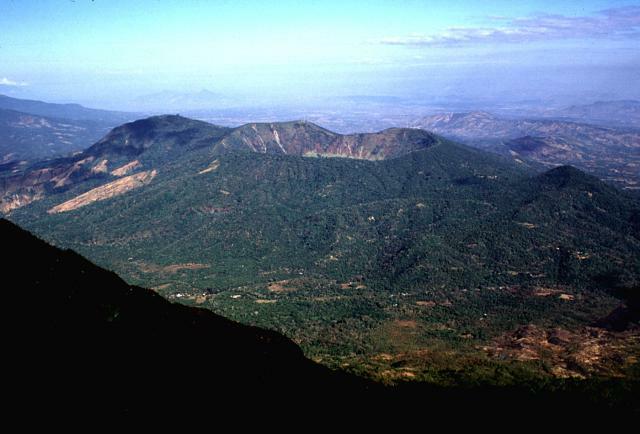 The Holocene cone of Cerro el Limbo (in the partial shade left of the caldera) on the western flank rises to a point above the level of the caldera rim. A group of fumarole fields is located on the north flank of the volcano near the town of Chinameca, and the volcano has been the site of a geothermal exploration program. Photo by Lee Siebert, 1999 (Smithsonian Institution). Caption: GVP. Serial No 1,626. Starting April 2010, each entry on this blog has a unique serial number. If any of the numbers are missing, it may mean that the corresponding entry has been blocked by Google/the authorities in your country. Please drop us a line if you detect any anomaly/missing number(s). No 1,627. In Montserrat: What Next? Fire-Earth wrote that Montserrat island could become completely uninhabitable by 2013 or earlier. Meanwhile, the Montserrat Volcano Observatory on February 21 reported that “the drainages leading down from Soufrière Hills, including the White River Valley, the Tar River Valley, and the Belham River Valley, were filled with fresh debris,” NASA Earth observatory said. The pyroclastic flows entered the sea via Aymers Ghaut more than a month ago, and the flows reached the sea near Plymouth on February 5, 2010. A massive eruption of Montserrat’s Soufrière Hills Volcano triggered by a collapse of Soufrière Hills’ summit lava dome covered large portions of the island in debris on February 11, 2010. Pyroclastic flows raced down the northern flank of the volcano, leveling trees and destroying buildings in the village of Harris, already abandoned after Soufrière Hills activity in 1995. The Montserrat Volcano Observatory reported that some flows, about 15 meters (49 feet) thick, reached the sea at Trant’s Bay, extending the island’s coastline up to 650 meters (2,100 feet). 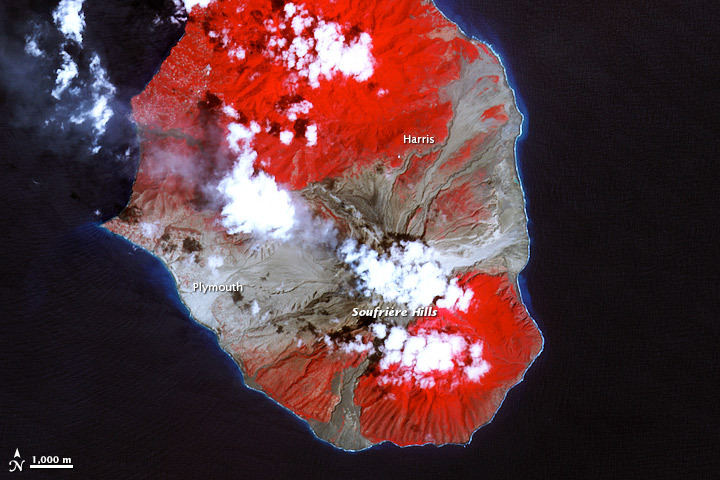 These false-color satellite images show the southern half of Montserrat before and after the dome collapse. The top image was taken on February 21, 2010, 10 days after the event. The bottom image shows the same area on March 17, 2007. 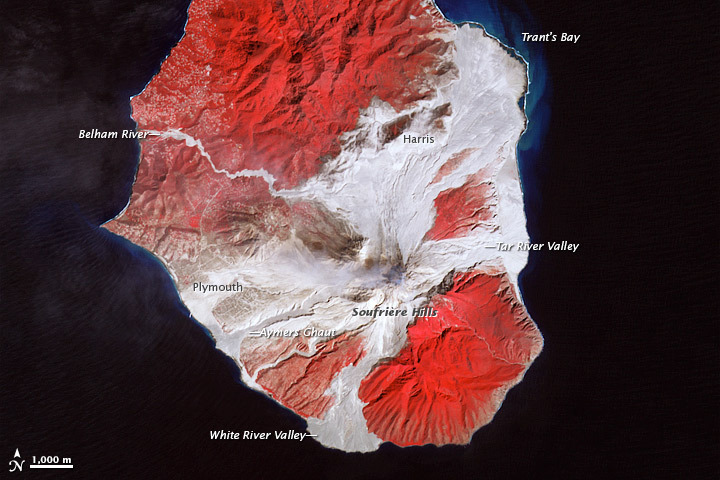 Red areas are vegetated, clouds are white, blue/black areas are ocean water, and gray areas are covered by flow deposits. Fresh deposits are lighter than older deposits. On February 21, the drainages leading down from Soufrière Hills, including the White River Valley, the Tar River Valley, and the Belham River Valley, were filled with fresh debris. Pyroclastic flows reached the sea through Aymers Ghaut on January 18, 2010, and flows entered the sea near Plymouth on February 5, 2010, Montserrat Volcano Observatory said. Note: Links to Montserrat Volcano Observatory have been removed because the site is used for commercial advertising and promotion of tourism.